The Hôtel Des Deux-Iles is a typical 17th century building located in the charming and historical Ile Saint-Louis, just a 10-minute walk from Notre Dame Cathedral and the Marais district. 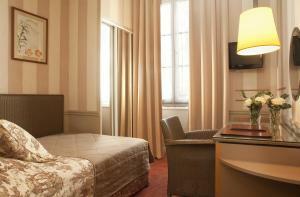 The air-conditioned bedrooms are decorated with simplicity and elegance. 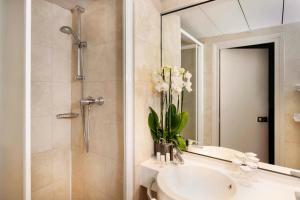 Free Wi-Fi access, satellite TV and a minibar are provided in each en suite room. The Louvre Museum is a 20-minute walk from the Hôtel Des Deux-Iles whilst the Luxembourg Garden is 1.7 km away. Pont Marie Metro Station is 400 metres from the hotel and provides direct access to the Opéra Garnier and Galeries LaFayette Department Store. For bookings of 3 rooms or more, special group conditions will apply - the first night of each room will be charged at the moment of booking. - the total amount of booking will be charged if cancelled less than 15 days before arrival. Please note that guests will be required to provide the credit card used to secure the booking, as well as corresponding photo ID, upon check-in. Written authorisation will be required if the booking was made with someone else's credit card. Guests are required to show a photo identification and credit card upon check-in. Please note that all Special Requests are subject to availability and additional charges may apply. 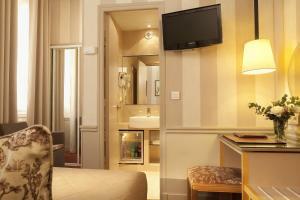 This air-conditioned room has a flat-screen TV with satellite channels and a minibar. The bathroom has a hairdryer and free toiletries. Rate: € 126.00 ... € 255.00; select dates below to get current rates. Rate: € 189.79 ... € 193.36; select dates below to get current rates. This family room features a satellite TV, minibar and soundproofing. This quadruple room has a minibar, air conditioning and cable TV.